San Francisco home sales just set a new high pole vault bar. An Everest-like $40 million to own a fabulous residence at 2712 Broadway in the Pacific Height’s Gold Coast neighborhood. That’s why it’s called gold. What do you get for $40 mill these days? Starting at the top of the five-floor contemporary design architecture there’s a winsome observation deck overlooking the north city landscape and the Golden Gate Bridge. Well, the entire SF Bay, really. And, you get 11,400 square ginormous square feet that underlie seven bedrooms, eight bathrooms plus 4 half-baths, a wine cellar, gym, movie theater, and a turntable parking garage. And, very nice and environmental, the home is constructed from green materials. For earthquake safety it sits on fifty piers set into the underlying bedrock. The new buyer is remaining privately incognito, but is not from abroad—according to the bizjournals.com story. 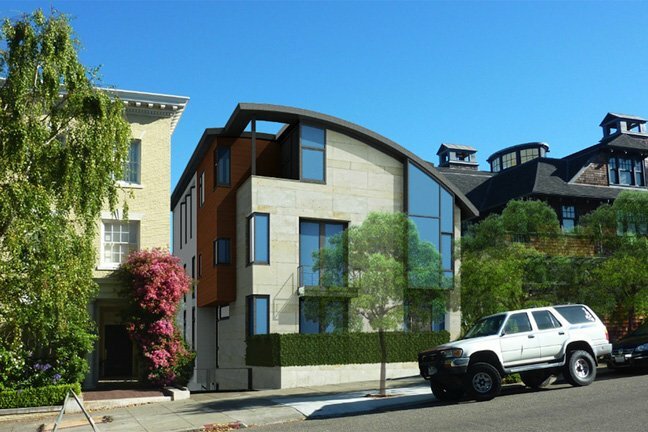 This house displaces the most expensive sale in SF that was previously set in 2013 for another Broadway house, going for $35 million.